This summary of NICE Lyme Disease guidelines sadly gives the impression to doctors, wishing to learn more about Lyme disease, that all is simple and easy to treat. Although hopefully more knowledge about early presentation might help some patients to access immediate treatment it does nothing to help the 90% of patients who are not diagnosed or treated early (CDC recognise that only 10% get diagnosed). Nor will it help the 20-40% of patients estimated by CDC (67% estimated by Johns Hopkins paper) who fail that early treatment. The NICE Guideline review set the parameters to exclude animal studies and yet the wealth of information these animal studies contain puts a lie to these opinionated NICE guidelines. Stephen Barthold retired veterinarian who worked for National Institute of Health for 25 years on Borrelia (Lyme Disease) states that 100% of animals remain infected after antibiotics – described as debris but it is often metabolically viable organisms. 12 months after treatment we see wide scale prevalence of spirochetes but it remains to be determined the role of this persistence – not everyone is showing symptoms. Persistence of Borrelia has been shown in animals including non-human primates, humans and in vitro. 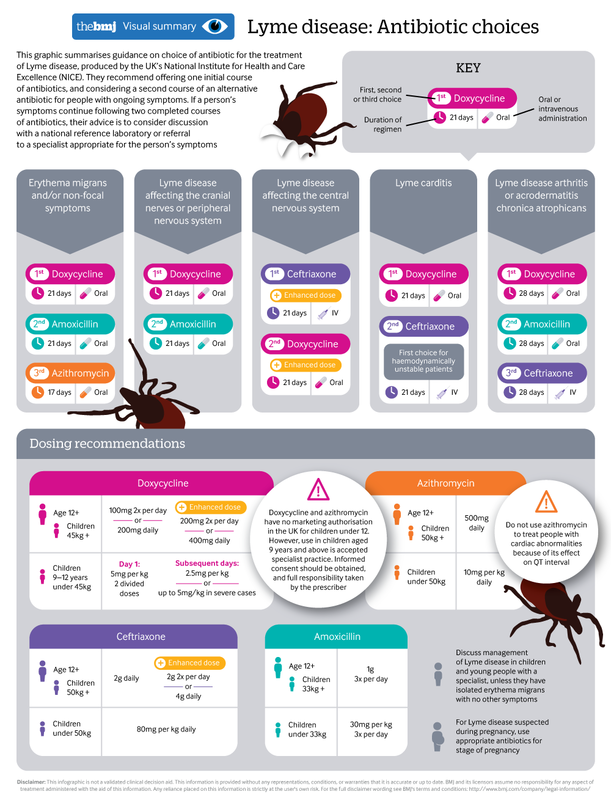 There is currently no doctor in the NHS who has any expertise in dealing with a Late stage of Lyme Disease, nor will there be if these Guidelines are followed. Patients are ping ponged to different medical specialists depending on their collection of symptoms already and that is clearly what these Guidelines intend should continue. Should the patient have immunological problems or a persistent infection or both there is no pathway to deal with that. Another parameter set by the Guideline review was to exclude co infections but ticks do not just carry one infection, there are numerous studies including UK ones where ticks are shown to carry multiple pathogens. We do not have good reliable tests for all known pathogens in UK ticks nor do we have data on how those infections can work in synergy. For forty years policy makers have played politics with this disease and thousands of patients have been refused treatment even when certain antibiotic treatments have been shown to help them. Whilst we still do not know how best to treat any stage of this disease, refusing access to treatment that helps, is abuse. We cannot cure HIV but we do not refuse those patients treatment that helps them.